We’re finally at the end of this series! It’s been so much fun – and WOW I can hardly believe how gracious you all have been with sharing your love! I really appreciate it…for a project this big and crazy, it’s an extra bit of work, so knowing that it’s been a blessing to you is extraspecial! Today’s is likely my favorite technique…I’ve been playing with it for a while now, and the Hero Arts stamp set I’m using today as well as the Penny Black die (products all linked below) just screamed out to be used for it! And the Craftaboard is definitely the best surface to achieve the look – it’s worth picking up some to try it out. But before I show you the video, I really really really want you to read this next bit. Okay now that you’ve read that, you’re safe to watch the video. If you want to see it in HD on YouTube, click HERE. 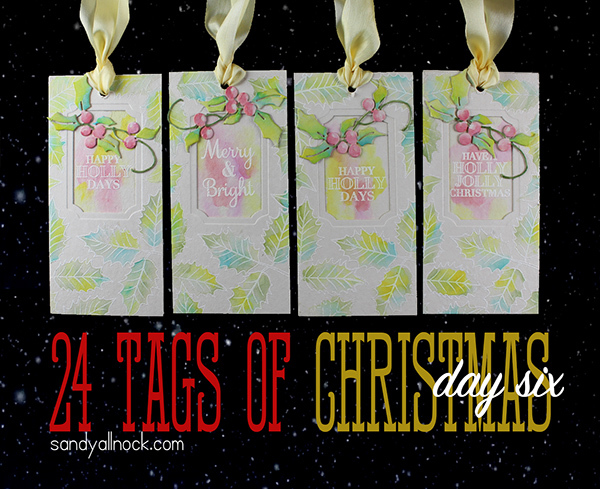 Here are stills of the tags close up…aren’t the colors just pretty? The photos were a little hard to take, they came out looking slightly pinker than they are in real life. But – if you WIN one, you’ll get to see it in real life! And how might you win one? Leave comments here on the blog posts, or over on YouTube, and you can get bonus entries by sharing the videos or blog post on your social media (either tag me or leave a comment with the url in the comments section of the blog post). It’s not too late to go back and visit the week’s worth of posts and be sure you’ve got your commenting up to speed! A bonus for my Patreon supporters – the extra tags (my practice tags, the whole tag set that got bumped for the monsters, as well as the two I shared over in The CLASSroom) are up for a drawing among patrons only! If you’re a patron, go get busy chatting on the wall! Need more tag ideas? Don’t forget to check out THESE – and leave comments to qualify to win! Excited to have turned another person on to the wonders of Frisket. See what she made HERE. I think that all of the tags you have done in this series are wonderful but I have to say these ones are my absolute favourites, they are stunning and look so sumptuous. Thanks Sandy for sharing your amazing designs and techniques with us all, I personally have learnt so much in the very short time that I have been following your blog. Wishing you and Mannie have a lovely Christmas and a Happy New Year, from one of your UK subscribers. These tags are gorgeous. I hope that you are signing the tags for the winners. I know if I am lucky enough to win, I would love to have it autographed! Thanks for sharing yet another wonderful technique! Love all your tags ! The kids in our family would love to see them on their gifts! You have inspired me, Sandy. Time to get busy making tags for the famiy. Hope it’s not too late to leave a comment and a chance to win a tag. I tried to submit a comment a couple of days ago while traveling but encountered a glitch. Anyway … I love this technique and cannot wait to give it a try. It is beautiful (like all is your designs)! And you make the technique look so easy. I bet it’d work wonderfully! These are so gorgeous! I don’t have a water brush yet, and am wondering if a little bowl of colorless blender with a small watercolor brush would work. What do you think? Thank you for all the tag ideas and your wonderful videos. Who knew, copic watercoloring. Yay. TFS, the tags are beautiful all of them. Thanks for the opportunity to win one, it would be an honor to have a piece of your art. I love all the tags but I think I love this one the most! I love the colors and everything about them! Thanks for sharing with us and I hope I win! ooh these are beautiful…If I ever get into heat embossing I will give these a try. I love watching you do anything…you are so good about making sure to list the products needed and you show how to use them. I have loved your tags! I always intend to make tags for the presents I give but don’t get it done. This year after watching your videos, I’m going to make my own tags! Thank you for inspiring me. And Thank you for sharing with all of us..I know that time is one of our most precious gifts and I am grateful that you choose to share with all of us out here. These tags are beautiful! What a wonderful watercolor effect with Copics! Can’t wait to try this – and how cool to discover the link to Frisket Franny! I Watched every day and love all the tags you created. But I must say this Copic watercolor look is my favorite. Thank you for sharing time and talent. Loved every tag in your series. Enjoy all your videos. You are very talented. Merry Christmas! I just bought a LARGE bottle of colorless blending solution LOL…I see doing this technique ASAP! Thank you again for sharing with all of us! Love this unexpected pastel Christmas palette — so pretty! So so pretty! You are awesomely talented!! Sad to see it end. Thank you so much Sandy for sharing these videos. Oh my gosh sandy! I just recently found your blog and I am blown away! Your talent is amazing and your teaching skills are as well! Thank you so much for your generosity! You make me think even I can create something this beautiful!! These are so pretty. I love the watercolor look. That is a great technique! I just love how it looks so much like watercolor when put on the card. Good Job! This is so beautiful. The watercolor look is so stunning. Thank you for sharing this technique. This has been a wonderful series. Although I did not use any of the techniques you showcased, the tags I made today turned out really well. Your tags inspired me to create better tags than I have in past years. I pick up so many little ideas from you that help me make prettier cards and keep card making fun. All of the tags are wonderful, but these are deliciously stunning! I want to make some now! These four are my favorites, also. Love the color combination. Hope I’m picked! You never cease to amaze me! I now have another way to use my markers. I love all your work and appreciate the time you have put into making these Tags. Thank you! Thank you for these videos! I looked forward to them every morning and learned so much. Merry Christmas! Great technique and the tags turned out beautifully. I’ve enjoyed the videos in this series. Thanks so much for sharing your talent. Well, now I have something else to try, I love trying new stuff, thanks for all of the excellent teaching sandy!!! 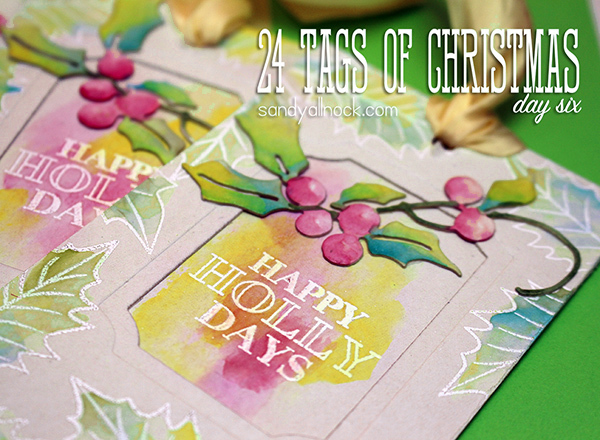 I have embossed, glittered, watercolored, stamped, kissed, color penciled, diecut and washied…. and have been afraid of copics until I found you! Thank you so much for sharing your amazing talent! Thanks Sandy! This has been super fun! 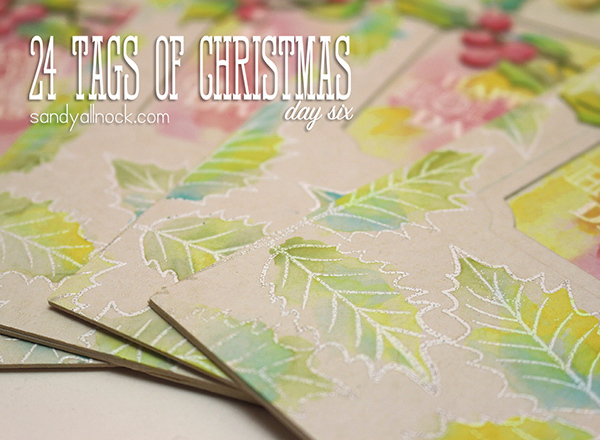 Very soft looking tags – very pretty! Such beautiful tags! Thanks again for sharing your talent with us!